Should Busking Be Banned at Yonge and Dundas? Two Torontoist contributors square off on the issue. In Torontoist vs. Torontoist, two contributors face off to debate a current issue, idea, or event. Photo by inventor_77 from the Torontoist Flickr Pool. One of Toronto’s busiest intersections could soon get a lot quieter. On April 28, Councillor Kristyn Wong-Tam (Ward 27, Toronto Centre-Rosedale) tabled a motion to ban busking at two corners of Yonge and Dundas. The proposed ban would prohibit buskers from performing at the southwest corner, by the entrance of Eaton Centre, and the northeast corner, by 10 Dundas, where Cineplex resides. Wong-Tam says a ban on basking—which came about after a string of complaints to her office—would alleviate pedestrian traffic on sidewalks that are often clogged with passersby. But many, including Mayor John Tory, are objecting, noting that street performers enrich downtown street life. 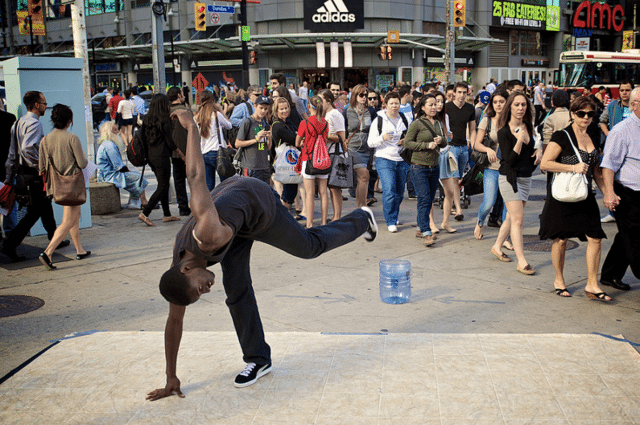 Should performers continue to make their living on the busy sidewalks of downtown Toronto? Our contributors debate the issue. City Council should ban busking at Yonge and Dundas until a “longer term policy or strategy can be developed” to address pedestrian and public access issues. I like buskers. I like anything that gives this city some life, because for all of the hype popular culture has heaped onto this city lately, we Torontonians sure hold on to conservative views. More than 37,000 signatures on a Change.org petition forced music festival North by Northeast to cancel Action Bronson’s free show last summer, slated for Yonge-Dundas Square. In a statement, NXNE said limiting artistic expression by cancelling shows is “distasteful,” and I have to agree—especially when these limitations affect a public space purpose built for big concerts. The decision to can Bronson is debatable, but Councillor Wong-Tam’s motion to suspend busking in its current state at Yonge and Dundas should be welcomed. Sunshine and tolerable temperatures bring the drummers, living statues, and pamphlet pushers of the 6ix out in full force. That’s great news if you want to be entertained, but it means the city’s busiest intersection becomes increasingly crowded by people more invested in sprucing up their Instagram page than crossing the street or using the TTC. I’ve seen “Spiderman” hang from the street light at the intersection’s southwest corner. I’ve gotten paper cuts from all the foam party handouts shoved in my face next to H&M. I’ve watched the aimless arguments with Jesus Hates You Guy (you know, the guy who broadcasts Bible-tinged rants with himself over a mini-amp?) turn into shouting matches bordering on fist fights. Yonge and Dundas’s current busker setup needs revising. The biggest issue is raised in the official motion: public safety. For some reason, very few seem able to keep their cool when a juggler breaks out a clear glass orb and plays dubstep over a Bluetooth speaker. People trying to use the sidewalk for walking or crossing the street in time are often jostled, or have their path completely blocked off without warning. More people than necessary are stuck waiting at street corners, just inches from moving traffic. People with disabilities get the worst of it; crowds exacerbate the issues of those with limited mobility, particularly people in electric scooters or wheelchairs who are in no position physically to fight their way through a crowded area. What precious little space there is to direct pedestrian flow isn’t used effectively from a congestion standpoint. An issue that Councillor Wong-Tam’s motion didn’t explore is the safety of the ones putting on shows, particularly those with reputations as antagonists. Take the aforementioned microphone-adorned preacher. I watched a screaming match take place between him and three onlookers last week that very nearly came to blows. There were no police officers or security guards in sight. That’s concerning, given the area is no stranger to random acts of violence. What the city doesn’t need is another stabbing at one of its most popular tourist attractions. If it passes, the motion bans busking indefinitely, and opens a review of busker bylaws to be completed by the first quarter of 2017. It wouldn’t be the worst thing to rid this intersection of its performers, but it would mean the city strips itself of some trademark Toronto experiences. Not to mention dedicating resources to the potential new rules’ enforcement. This strikes me as a massive capitulation. Busking is a unique feature of a thriving pedestrian environment. It can only exist in the few areas vibrant enough to support it, and the fact that Yonge Street is one of those areas is a good thing. It brings colour to a street that we have, for better or worse, tried very hard to brand as Toronto’s Times Square. People enjoy it, and they come to experience it. I wouldn’t advocate engineering a crisis as a means of pushing an agenda, but the massive pedestrian congestion on Yonge developed organically, and it’s an opportunity. There’s a lot to learn from an area like this, and if we manage it right, it can act as a model for pedestrianizing other areas of the city. The work is already underway. Last July, Council agreed to examine ways of re-imagining the Yonge corridor from Queen Street to Gerrard, including considerations such as widening sidewalks and adding bike lanes. It was a move shepherded by Councillor Wong-Tam herself, with the support of the local Downtown Yonge BIA. The study will even consider narrowing or removing traffic lanes. The fact that a council that is about to tie itself into knots over a pilot project for bike lanes on Bloor agreed to even look into removing traffic lanes on Yonge shows a rare maturity, and it is a huge political achievement on Wong-Tam’s part. Why shy away now? Let’s see what sort of opportunities present themselves through this study. Of course, issues of accessibility are an essential consideration, but we already have very specific bylaws in place that address where a busker can operate. According to the City website, buskers and their audience must leave three metres of paved and passable space, and may not obstruct transit stops, postal boxes, telephone booths (which I guess still exist), building entrances, or fire hose connections. If buskers are infringing on those bylaws, that’s a job for bylaw enforcers. I won’t accept that these bylaws are just impossible to enforce. We’re not talking about Uber, here, with high powered lobbyists, lawyers, and an almost supervillain-esque strategy. These are people who want to make a little scratch entertaining passersby. It’s reminiscent of the crackdown on drinking in parks. We already have laws against being drunk and disorderly, or urinating on some nice old man’s porch. Enforce those. Why hassle the people who brought wine to their picnic? Don’t let a few bad apples spoil the bunch. Don’t ban everything fun because it has the possibility to get out of control. It’s the same deal with buskers. Let’s enforce the bylaws we have, instead of throwing our hands up, and banning the whole thing. And think about the buskers who will have only just renewed their $43.21 annual licence last month, and were probably counting on the money they’d make this year on prime real estate like Yonge and Dundas. It’s already difficult enough to make money in the arts, in any capacity; let’s not throw one more impediment in their way. Since 2013, Yonge has been home to Buskerfest, which sees entertainers from all over the world on stunning display, all to raise money and awareness for epilepsy. It would be ridiculous if, for the remaining months of the year, buskers were banned from the home of Buskerfest. Pedestrian congestion means we’re doing something right. It means the street works, that people are attracted to it, and that they’re opting for active transportation and exploration, and leaving the car behind. Let’s embrace this opportunity to really push for change in re-imagining Yonge street. Let’s make these pedestrian realm improvements a reality. Why make concessions in the battle for the public realm, when we’re so close to declaring a victory?